Previously released under the name of The Raven: Legacy of a Master Thief back in 2013, developed by King Art Games, The Raven Remastered is an updated version of their beloved episodic point-and-click game that first popped up last year before finally making its way to Switch. Has the wait been worth it? Let’s find out! First and foremost, The Raven Remastered is a detective story. Set in 1964, there is a criminal at large and assuming the role of Anton Jakob Zellner, a middle-aged constable for the Swiss police service, players must do all that they can to help apprehend the elusive fugitive. It all starts with a robbery at the British Museum, during a cut-scene, players are offered a glimpse at a daring heist that sees a ruby stolen by a man wearing a raven-faced masked. Has the Raven returned or is this someone new, who just so happens to be following in the original Raven’s footsteps? These are just some of the questions that players will be tasked with finding the answers to and in your efforts to uncover the truth, you will have to go the distance. In mere hours and across three chapters, you will have the pleasure to ride aboard a train travelling through the Alps and undertaking a cruise before ending up in Cairo. Oh yeah, quite the ride awaits you, everyone has something to hide, trouble is always around the corner and nothing goes as smoothly as it should it this crime drama. Still, remaster or not, I don’t want to spoil the game for you, so that’s enough about the story, it’s time to move on to gameplay. Being a point-and-click game, The Raven Remastered follows the old formula of go here, examine this, take that, put these two items together and if you get stuck, talk to everyone. All standard stuff really, which doesn’t break the mold. For a quick skim through the controls though, the likes of the A button is used for interactions, X can be used to provide hints, with the likes of Y being used to bring up your inventory. Then you have the left analog stick for walking, the right analog stick for moving to areas, objects and people you can interact with and the + button is great for bringing up the game’s pause menu, which is the place to go should you wish to save your progress. Despite how basic the gameplay is however and the winding paths the story takes players in, where The Raven Remastered makes its mark, is in the visuals. It’s not drop-dead gorgeous and seeing Zellner drinking from an empty champagne glass, with his mouth closed, feels like lazy animating, but the cut-scenes and animations do help give the game some vitality. Although part of that is down to the voice acting. While some accents come across as being poor, for the most part, they do fit the quirky characters they supposed to come from, and help make each interaction distinct. The soundtrack, however, is enjoyable all throughout and as part of the game’s extras, provided you unlock it, you can view a video of The Raven in Concert. As for other extras, unlockable bonus material does consist of a concept art gallery a 3D models gallery, an artwork gallery and the game’s soundtrack, but in order to unlock them, you will have to play the game from beginning to end. Ultimately though, despite the few things the game does right, this thrilling tale of mystery and wonder, does come across as trying too hard and there were a few instances where it was pulling me out, instead of drawing me in. Still, I did like Zellner’s notebook, which stores various and drawings as the game goes on and I am happy to report I encountered no performance issues. Yet, if this was a book I borrowed from the library, let’s just say for me personally, it won’t be overdue any time soon. As far as point-and-click games go, The Raven Remastered is not the worst in terms of gameplay and even the visuals can be rather nice to look at, but as a crime drama that tries to act as a novel, I’m afraid it’s not as gripping as it could have been. Having avoided the initial release, the events of the game were no to me, but the horror novelist in me had managed to deduce a number of the twists, fairly early on in the game and my dedication to beating it, was more due to me wanting to know if I was right, as opposed to wanting to see how it all unfolds because I was deeply invested. 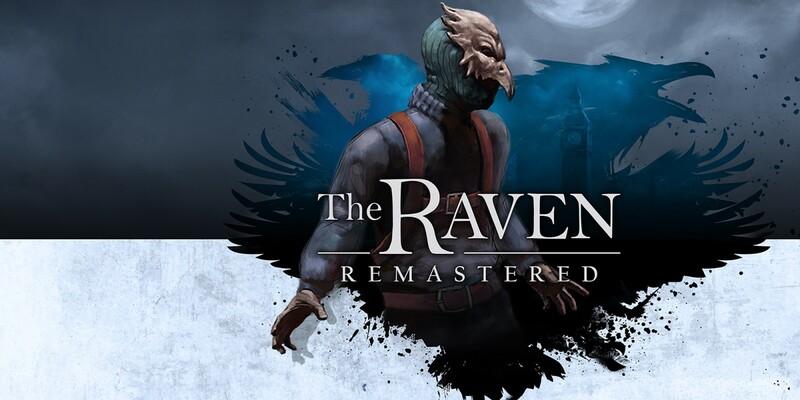 Quite simply, much like the killer in most crime novels, the further down the rabbit hole you go, the more mistakes the killer/game makes and in the end, The Raven Remastered can’t help itself but dive off the deep end and in favour of an elaborate plot, which ultimately isn’t as well-rounded as it should have been. Bigger may be better, but there is a reason why sometimes people say “less is more” and this is one of those times.